The Porsche 956 and 962 family were the most successful sports cars of the 1980's, if not of all time. Chassis 106B has a unique history starting with Richard Lloyd's GTi Engineering purchasing 956 106 from the Porsche factory. After campaigning 106 in its original guise GTi concluded the only was to compete with the factory entries was to develop a new chassis. This chassis, designed by Nigel Stroud, featured some notable differences from the original - it was constructed in aluminium honeycomb which increased longitudinal stiffness and featured rising rate pullrod operated front dampers. The new chassis was fitted with the running gear from the original 106, the chassis of which was sold to the Brun team. As a unique gesture of goodwill Porsche issued GTi with a factory chassis plate christening the car 106B. The new chassis proved immediately competitive married to Stroud's uprated aero package. The car finished 2nd at LeMans in 1985 before suffering a massive accident at Spa a few weeks later. The honeycomb chassis was credited with saving driver Jonathan Palmer from serious injury. 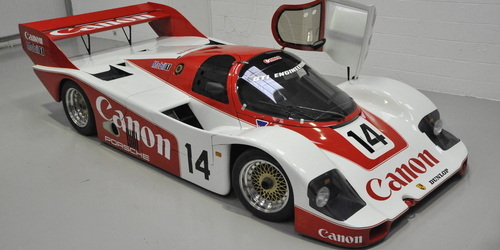 The car was rebuilt and achieved a memorable win at Brands Hatch in 1986 in the hands of Bob Wollek and Mauro Baldi. After a few weeks getting the bodywork to fit correctly the coolers are now going in. These include the water coolers, heat exchangers that use water to cool the air as it transits between the turbochargers and the plenum chambers and the oil coolers. The Porsche engine is now ready to go back together and one of the first jobs is to trial fit the main bearings. Here Mark is torquing up the cross studs using a combination of torque and angle to achieve the correct stretch in the studs. The upper wishbones requires us to make up some shims as the spacing of the rear mount is not quite correct. In the past it looks as if it has been crushed down which is not ideal. The chassis loom has now been installed and looks very smart. The dash is also now fitted out. After a 2 year wait the fuel cell and pumps have now been installed. They look great.